"Imagine you’ve just had an ideal week. What 3 things did you complete?" "I have a tremendous fear but I don't know what's causing it." "How do I reduce my fear of failure? It is holding me back." "I should be so much more in life, but I am not. Help!" Having a paralyzing fear of failure feels like being stuck in a deep pocket of quicksand. You're probably not happy with your current situation, however, you're too uncomfortable with your options for making meaningful change your life. We're great at procrastinating and coming up with 100 reasons why we can't move forward, but those are just manifestations of being afraid. Fear of failure could actually be a fear of several different things. It might be the fear of being criticized or judged. Or it might just be the fear of wasting time on something that we don't think will work out in the end. Unfortunately, a fear of failure will prevent you from ever really knowing your true capabilities. Failure isn't always about you! A great way to make yourself feel depressed is to internalize negative experiences. Try considering your contribution to the situation. Many factors are outside of your control and it's foolish and counterproductive to take all the blame. For example, not acknowledging the effect of the economy on your new business venture, or the effect that distance has on an intimate relationship, isn't reasonable. Any failure has contributors that aren't under your immediate control. Is everything always your fault? Stop it. See It From A Child's Perspective. Is a very young child afraid of failure? Of course not! The concept is entirely foreign to a young child. This is good, since none of us would have ever learned to walk! Failure is just a mental construct. Learn to enjoy the process of seeing just how far you can take something. Make your goal more about discovery than about accomplishing something specific. Can you overcome your fear? What will it take? One of the best ways to figure out what works is to figure out what doesn't work. We learn by trying ideas. Regardless of whether or not an attempt is successful, you learn something every time you try. Then it's just a matter of applying what you've learned to develop a better solution for the next attempt to achieve the results you desire. Are results the only thing that matters to you? Stop it. Keep trying! Have a clear vision of your desired results. Sometimes fear of failure is actually a fear of failing other people's expectations. But their definition of success might not match your own. It's your life. Choose your own vision of success. What does success really mean to you? If you don't try, you will feel regretful, depressed or angry. Sometimes the pain of sitting on the sidelines is stronger than the fear of failing. How will you feel in your later years if you don't put forth your best effort now? Most seniors regret the things they never tried, not the things at which they failed. How will you feel if you never try? Could you handle it? What contingency plans could you put into place? If you're prepared for the worst, there's no reason to fear failing. What's the worst possible outcome? 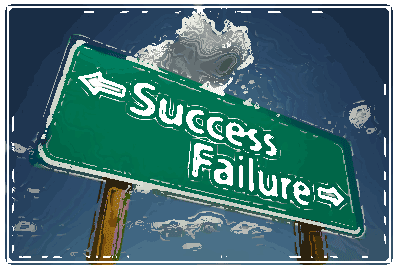 Minimizing or eliminating your fear of failure is critical to being successful. At some point, it's important to forge ahead in spite of any paralyzing fear you may have. There’s nothing wrong with taking action, even if you’re a little uncomfortable. Dealing with discomfort is a part of success. Use these six tips to help you overcome and conquer your fear of failure. Your life will be enriched in many positive ways and you'll never look back. Overcome your fear of failure and solve your problem, click here. In this day of personal makeovers, we've seen people lose 250 pounds, get a new house, and finally go after their dream career. But for many, an alteration of attitude alone can bring a transformative life experience. Learn how to create a life you’ll love and never look back. You already have everything you need to get started. Implement these seven action tips immediately. Learn how to dramatically change or improve your life. Follow these strategies and get started. It’s never, ever too late. Learn how to let go of your need to be perfect. You’ll be more satisfied with your life and feel much more joy. 5 Super Simple Steps To A Brand New You! Do You Commit These 7 Deadly Sins Of Thought? What Is Holding You Back In Life: Comfort, Habit, Resistance or Fear? I, Jeff Cohen, Founder of SolveYourProblem, select high-quality, hand-picked products for which I earn a commission. Links which help you to solve your problem reflect this. I hope this demonstrates my intent to run an honest and reputable website. Have a great day!